Mccalls 5752 is a great dress pattern! It's the third time I used it, and like wine it just gets better over time. 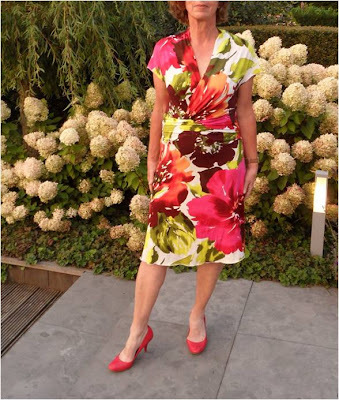 I made this dress in a solid, in subdued colors, and now in fabric that has 2-feet brightly colored flowers on it, and it looks good in all of them. It's a Palmer&Pletsch pattern, and the instructions are pretty great. There are plenty of tips to help you achieve decent fit, and every step of construction is explained clearly. The gathered waist panels of this dress are very flattering, and hide tummy-fluff. However, I think you should permanently stitch the ruffles to the middle of the midriff band. Otherwise, they might look sad and droopy. Full Bust Adjustment (FBA). The how-to is very well explained in the instructions, here's how I used them. As this fabric has a really large print, placing the pattern pieces takes a little bit of care. Here's a list of what I think is important when working with a large print. Getting all the pieces out of 2m and paying attention to the placement of the flowers required some fabric tetris, and I didn't completely succeed. There's a very small triangle inset in the skirt where the fabric was an inch to short. I also added a skirt lining to prevent unwanted see-through effects. Bonus: the skirt hangs much nicer now that it’s lined. As usual, I added elastic at the shoulders to prevent stretching. My only regret for this dress is that I won't be wearing it. I was seduced by the great fabric, even though I knew, I knew, that the colors really wouldn't work for my skintone and hair. I look like a zombie in neon-colors in this thing. Very sad, but my loss is someone elses gain; My superstylish mom totally rocks this dress. Lesson learned; Don't buy pretty fabric in colors that don't suit you unless you want to make another dress for your mum. Is that your mum in the photo? The dress looks lovely on her. I love your diagrams they're brilliant! yup, that's my mom. Luckily (also for future-me) we share the same size.